Welcome to another Guest Dare – the October edition. For those new to the feature, our Guest Dare is a monthly endeavor in which we invite an unsuspecting victim to read a book totally outside of their comfort zone. You can read all previous Dare posts here. Summary: A steampunkish romantic fantasy set in Ondinium, a city that beats to the ticking of a clockwork heart. Taya, a metal-winged courier, can travel freely across the city’s sectors and mingle indiscriminately among its castes. A daring mid-air rescue leads to involvement with two scions of an upperclass family and entanglement in a web of terrorism, loyalty, murder, and secrets. I’ll be honest, I’m a romance reader through and through. Solidly 98% of what I read falls into the genre of romance, and the other 2% is usually Young Adult with strong romantic overtones. So when I emailed Ana and volunteered to be a victim of the Guest Dare, I was hoping they’d push me far outside my boundaries. Ana and Thea sent the list to me, and I decided that I needed to step outside my comfort zone, but still wanted at least a minute dose of romance to go with my Guest Dare. 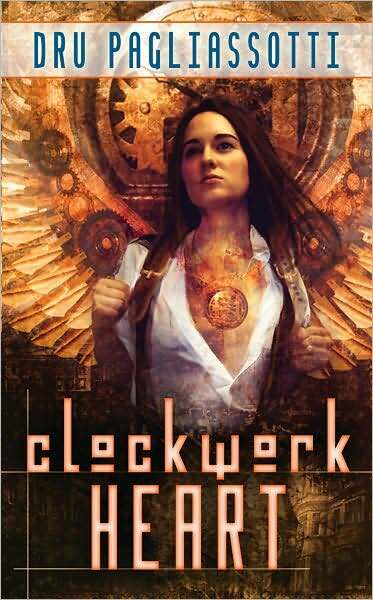 I ended up choosing Clockwork Heart by Dru Pagliassotti. I remember Thea’s review of it, and that she’d truly loved it. And I also remember reading a conversational review about it on Dear Author, although I didn’t really remember anything about the story. I was nervous when I got the book. It has this beautiful cover featuring a woman who is wearing a contraption with wings on it, and what looks like the workings of a clock behind her. I knew the book was supposed to be steampunk, and I’d read and been interested in Katiebabs’ primer on this unknown to me genre, but honestly just didn’t know where to start. I figured Clockwork Heart was as good a place as any. Honestly, I was lost from almost the beginning. The world which Pagliassotti has created is obviously a complicated one, with multiple castes, a complex technological world, and a character whose role in that world was not readily apparent to me. Taya, the main character, is an icarus, one without caste, who is a messenger of sort, delivering missives throughout Odinium (the world)’s sectors, and able to mingle within any of the castes. She finds herself drawn into the public eye when she makes a daring rescue of an upperclass woman and her son. She is honored for her heroism, and because of that, finds herself entangled with the Folare brothers, Alister, who is a leader in this upperclass world, and Cristof, who abandoned his honored roots, and works as a master clock repairman. Alister romances and intrigues Taya, while Cristof raises her hackles and suspicions about a terror plot that seems to be undermining the power of the ruling council and something called the Great Engine, which is a sort of machine that is revered in Odinium for its power. I ended up having to email Thea to have her talk me through the world construct and the role of the Great Engine throughout the book. I was literally midway through the book and felt I couldn’t go any further with the story because I didn’t understand the world’s rules. Thea graciously talked me through and I kept reading. I think that my problem with the book was that it was trying to be many, many things all at the same time. There was a mild romantic thread throughout the story, a love triangle of sorts between Cristof, Alister and Taya. It is Taya’s attraction to Alister that leads to her involvement with Cristof. There is a mystery/suspense thread concerning the identity and motivations of the terrorists and whether Cristof or Alister had any involvement in the plot to overthrow the ruling party. There is a fantasy bent in the world’s construct with the apparatuses and machines utilized by the characters, which are unusual and I suppose in keeping with the steampunk feel of the story. For me, it was all too much. I lost threads of the story by becoming too bogged down in the technology and my confusion about the construct of the world. I felt frustration with Taya, who I felt became involved in the lives of the Folare brothers without sufficiently represented motivation and who took a number of what I thought were ill advised chances. But more, I just always felt a step behind. As if I’d missed some critical description of the world that would have helped me better understand, not just the technology, but the culture that Pagliassotti was trying to convey. Honestly, it’s hard for me to evaluate the book, because I truly believe that those who have read and enjoyed the steampunk genre probably would really love the story. But for me, it was a case of the book attempting to do too much all at the same time, which resulted in a lot of confusion and frustration for me as a reader. This is a book that I honestly slogged through, and would have DNF’d if it weren’t for the guest dare. All of this being said, I am pleased with myself for stepping outside my comfort zone. This exercise just illustrated to me that my comfort zone exists for a reason. Thank you so much Ana and Thea for pushing me to read this book. Even though it wasn’t a winner for me, I am proud of myself for picking up something that I would never have read otherwise. Kati, we are sorry that you didn’t enjoy the book – but thanks for playing anyways! 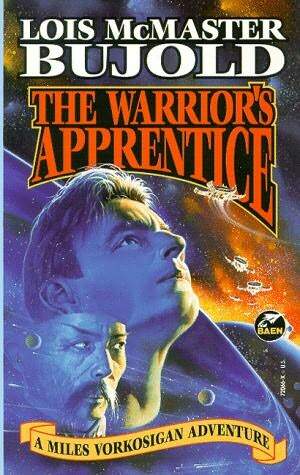 Next on the Guest Dare: Rhiannon Hart reads The Warrior’s Apprentice by Lois McMaster Bujold. Oh, too bad you didn’t like it. I loved this book, but if you don’t feel like you’re grasping the world building, I understand that being a big problem. Based on these thoughts, I would recommend that Kati NOT get started on Robert Jordan’s ‘Wheel of Time’ series! Cast of thousands, literally (OK, that’s if you count the members of all the armies involved – but still). I can appreciate that heavily complex stories are not to everyone’s taste. For me, OTOH, this description actually makes the book more attractive. I love meaty and complex, and actually didn’t like a portion of the romance I’ve read precisely for the reason that I get bored if it’s all about the couple, all the time. I crave secondary and even tertiary characters, and if there are no subplots I easily get the feeling that the protagonists are wildly egocentric people, thinking the world revolves around them and nothing else matters. To each his own, and how marvellous that we live in a world with so, so many authors producing work of all kinds, so everyone will find stories to their taste. Kudos to all bookbloggers for helping readers finetune their TBR lists! oops. didn’t mean the previous comment to be anonymous – just got excited I guess! I think a lot of times people who are great fans of a particular storyline (romance, SF, mystery, etc.) have a harder time wrapping their brains around something that combines genres. You hear a lot from fantasy fans who hate it when their fantasy is interrupted for a love story, or straight romance fans who are like “enough with the worldbuilding, where’s my romance?” This is the danger of writing cross-genre, as I do. Though the upside is that for fans of multiple genres, it can hit all our buttons at once, and we end up loving it so much more than anything that only covers one. That’s definitely what I find when I read fanatsy or sci-fi romance (romantic fantasy or sci fi?) like CL Wilson or Nalini Singh or Scott Westerfeld or Holly Black. Hi Everyone – Thank you for your comments. I think it’s a point well taken that readers of one genre exclusively might have a harder time wrapping their arms around a genre-bending book. I think that part of my issue with this book was that the technology, which was almost a character in the book, didn’t capture my imagination. So I had a hard time keeping things straight because I couldn’t really picture what was being described. In all seriousness, I emailed Thea and was like “Is the Great Engine supposed to be God?” LOL! Talk about missing the point. SIGH. I think I’ll crawl back into my romance reading corner and curl up with some Jo Goodman. But truly, Thea and Ana, I’d love to be a victim again. Keep me in mind for Guest Dare Part Deux. I’m glad you tried it, Kati. And sorry it didn’t work out for you. I loved this book, but as others have said, I can see how someone not used to genre blending would have a hard time sinking in. Good for you Kati trying something so different. I liked it! I am sorry you didn’t. I actually enjoyed the world though.